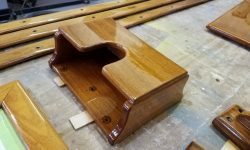 In the cockpit, I finished up the detail sanding at the edges and corners of the nonskid, places I’d not been able to reach with the power tool earlier. 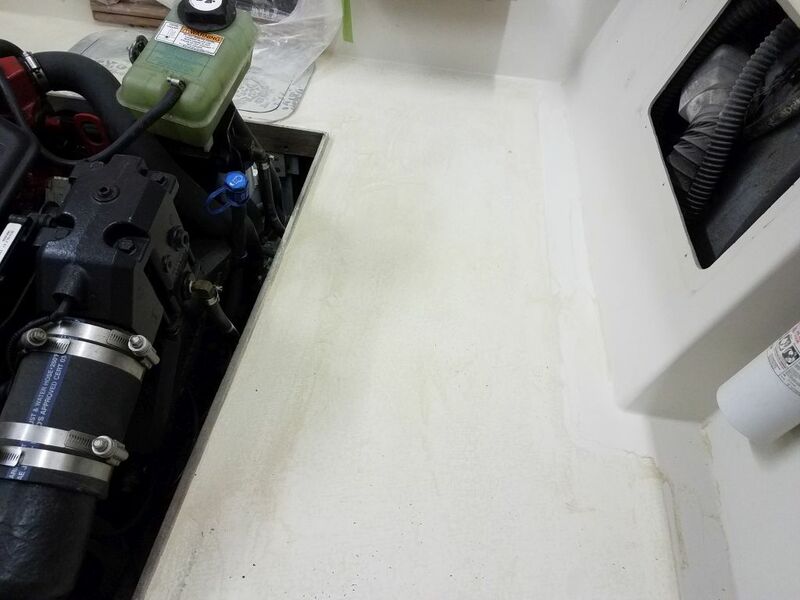 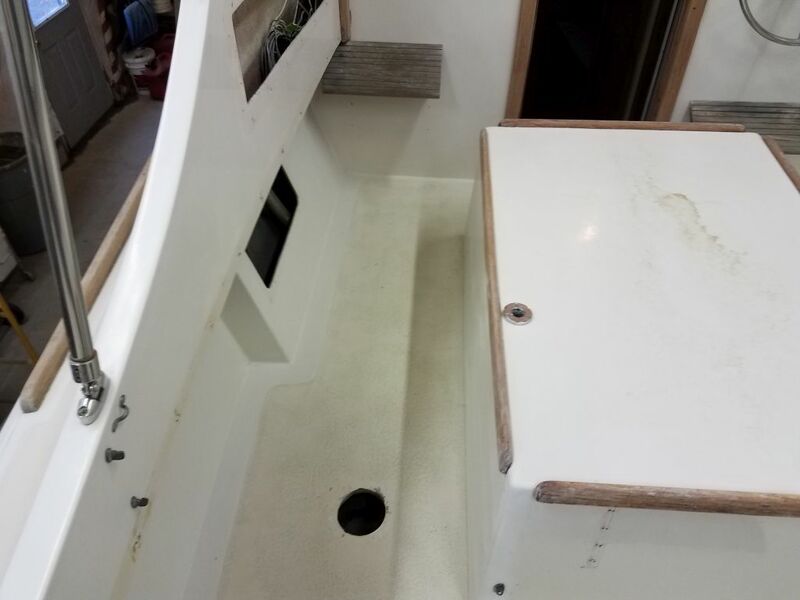 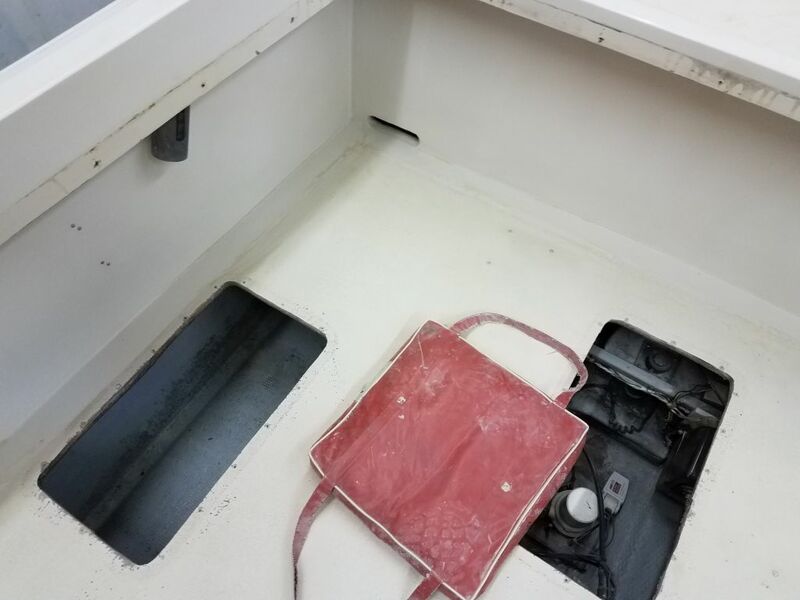 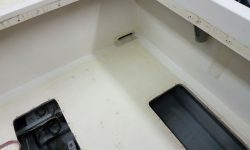 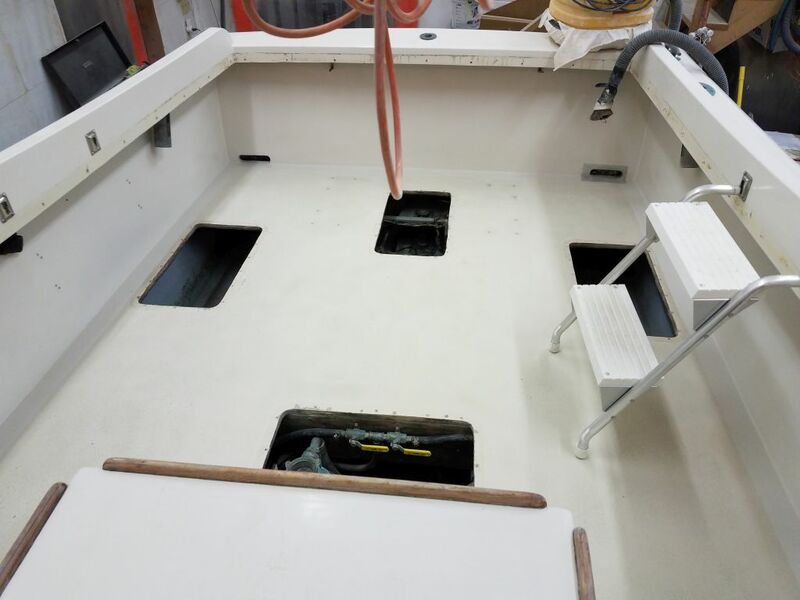 I also sanded the area beneath the hinged engine box, and a couple small areas of the deck just outboard of the cockpit. 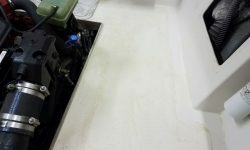 The owner requested that I apply nonskid to the top of the engine box, which was currently plain white gelcoat. 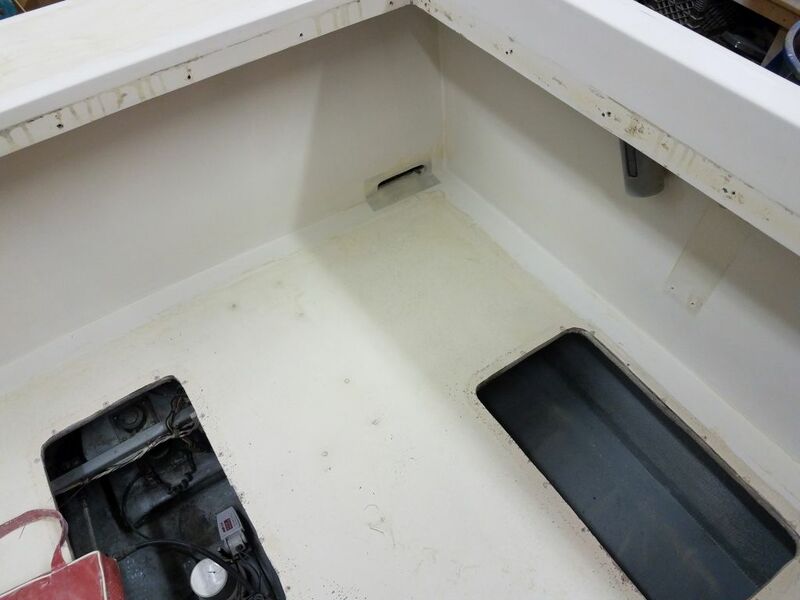 I planned to lay out the borders for the new nonskid area and sand and prep the engine box a little later. 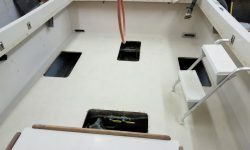 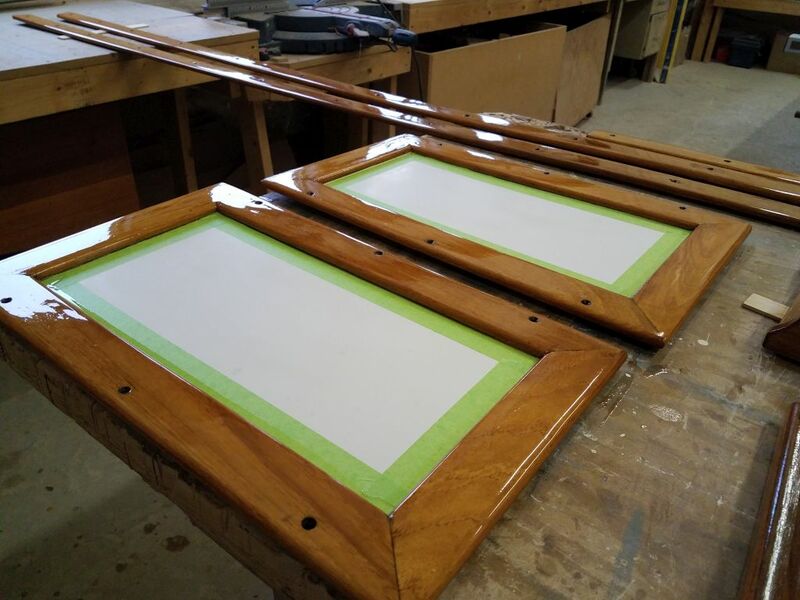 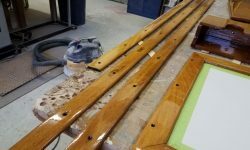 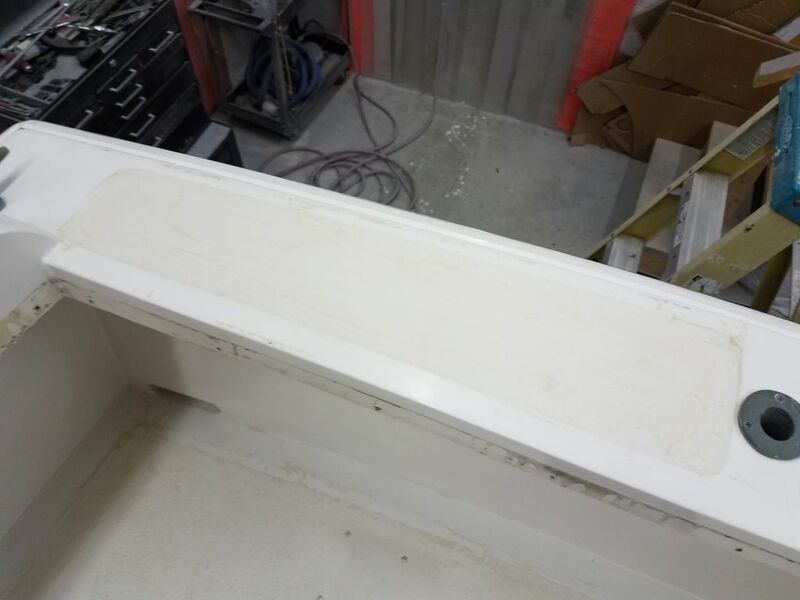 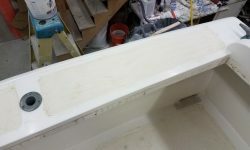 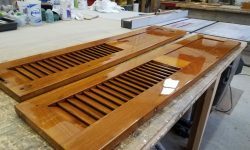 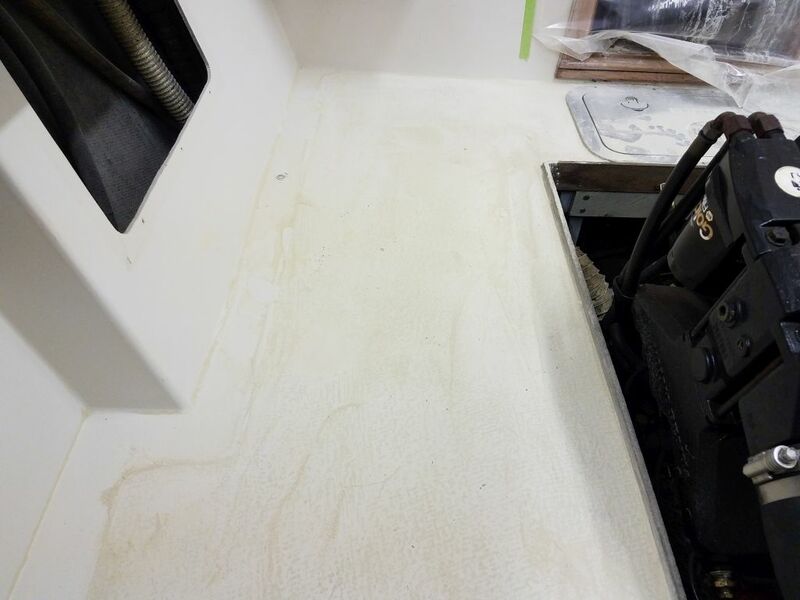 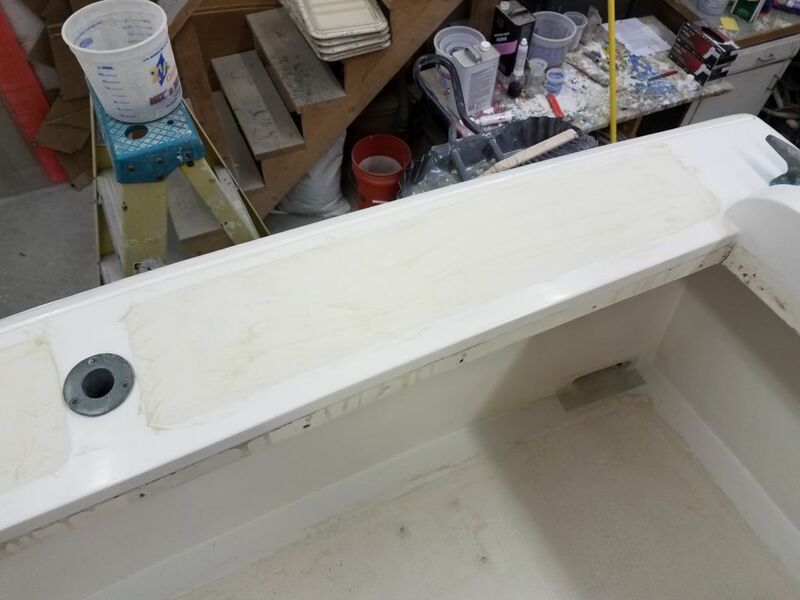 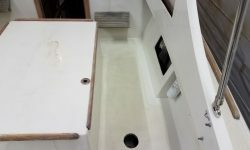 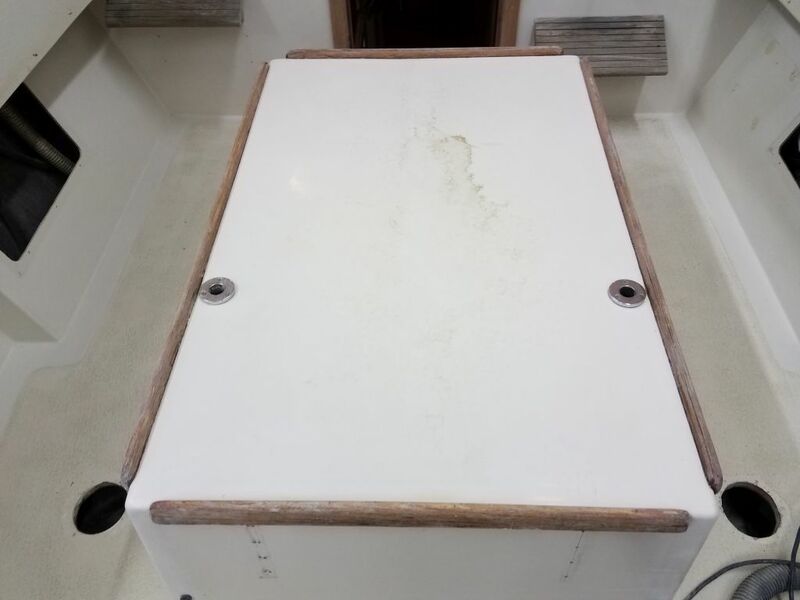 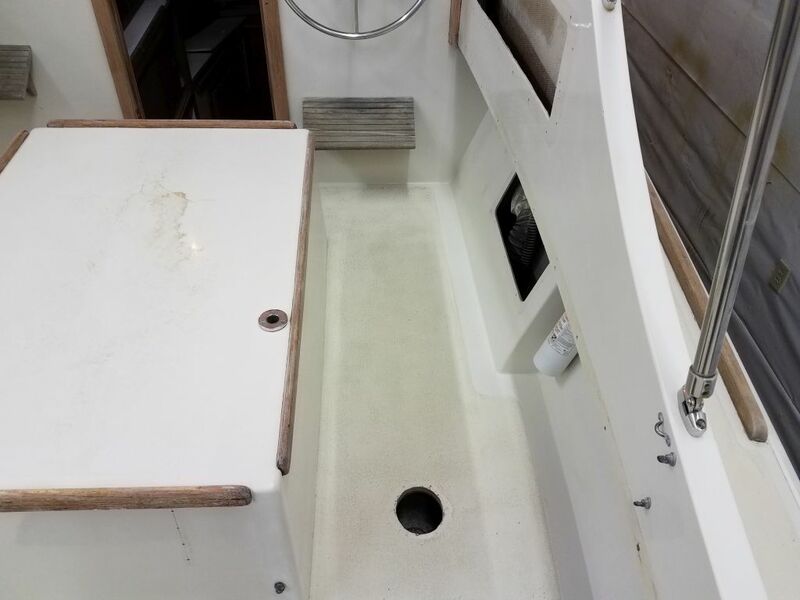 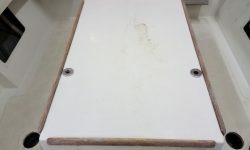 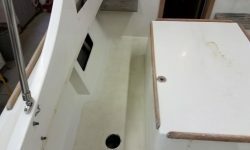 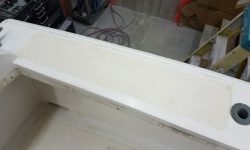 Armed with new materials, I turned my attention once more to the gelcoat patches (3) around the boat. 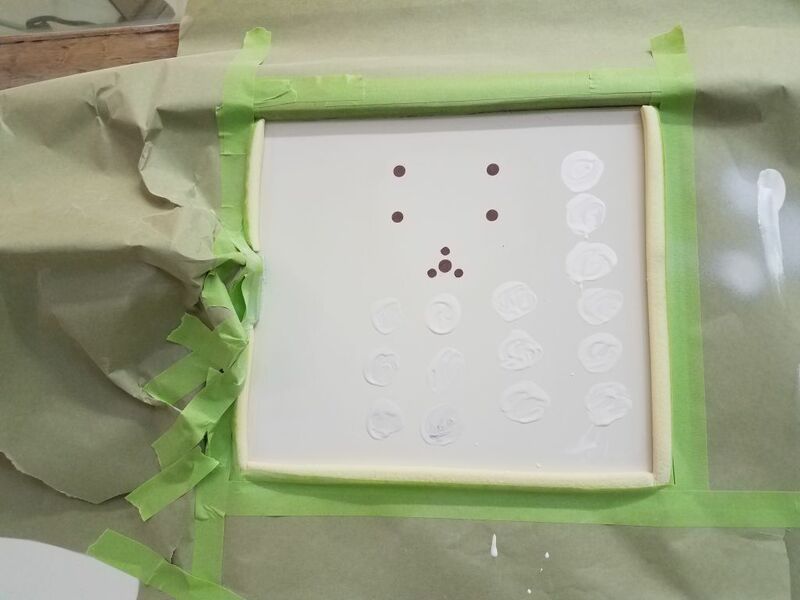 Starting with an ample amount of white gelcoat, I slowly added pigments, using only bits of black and brown since I’d determined last time these were the only colors needed. 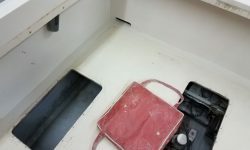 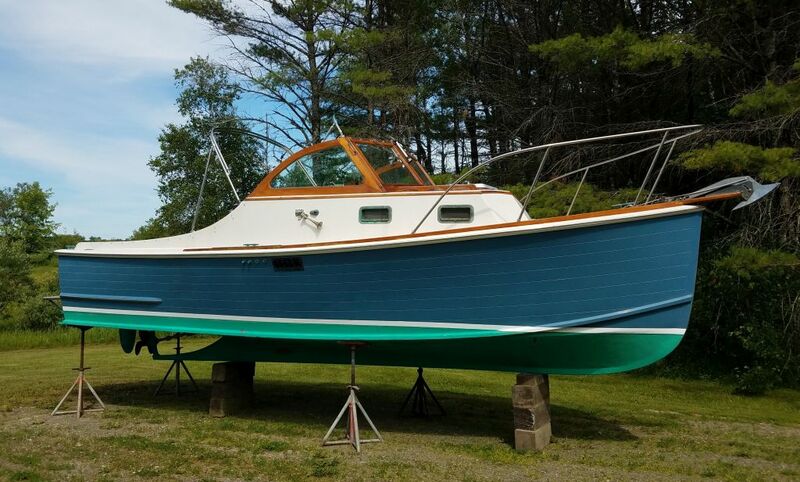 Not wanting to steer the mix too far in one direction, and knowing, thanks to my experience earlier in the week, that the existing gelcoat was a tough match that somehow incorporated both gray and beige tones, I proceeded in tiny increments of color, testing each uncatalyzed mix in two places on the boat and allowing the test to dry (and perhaps slightly change color) before adding more pigment. 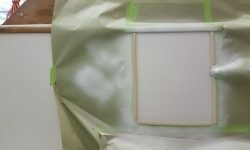 At length, I decided I’d gotten a reasonable match. 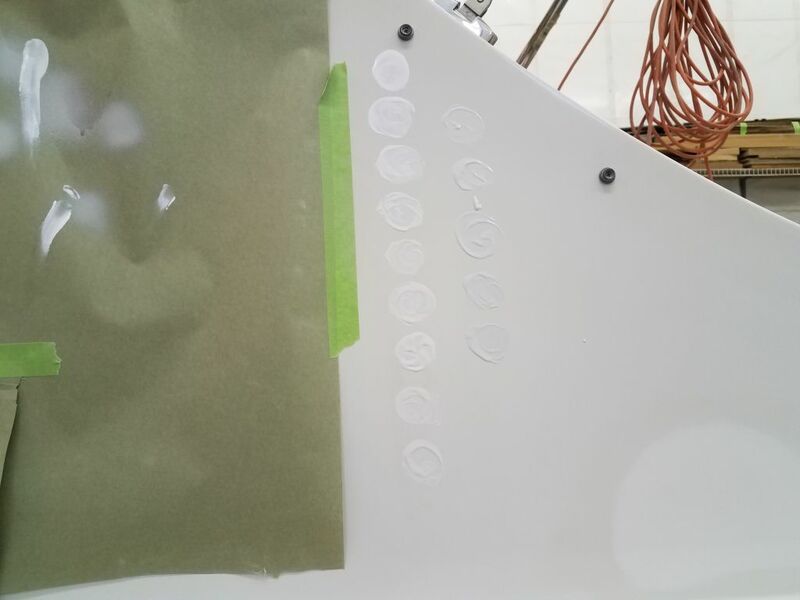 The color procession here starts at the top right column and proceeds downward, then to the left and down from there, so the final color sample is the bottom of the left-most column. 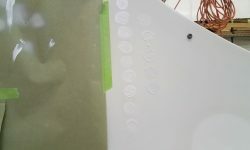 Here, the color procession begins at the top of the left column and proceeds, down, then to the right column and down, so the final match is at the bottom of the right-hand column. 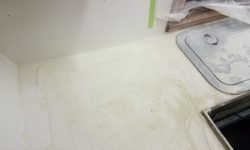 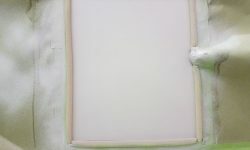 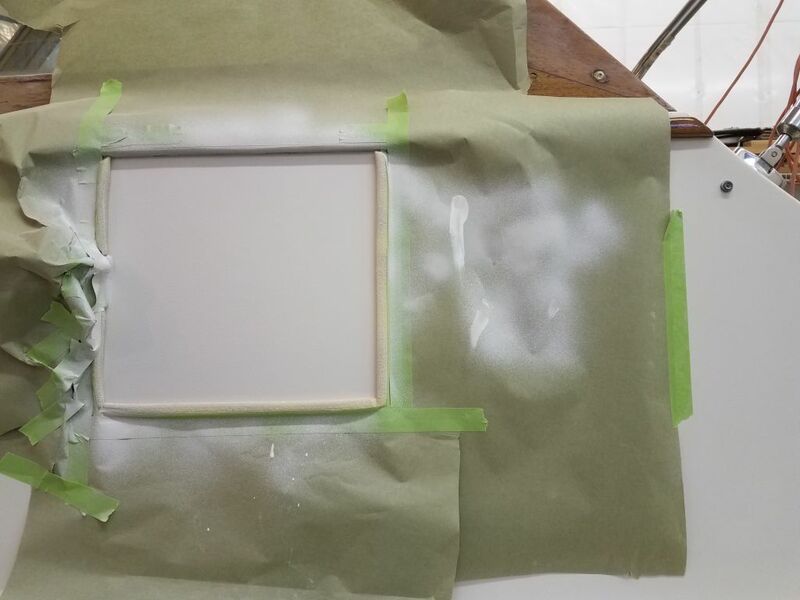 Once I was satisfied with the color mix, I catalyzed about half of the mix–reserving the other half should I need it–and, in several coats, sprayed the mixture on all three patches. 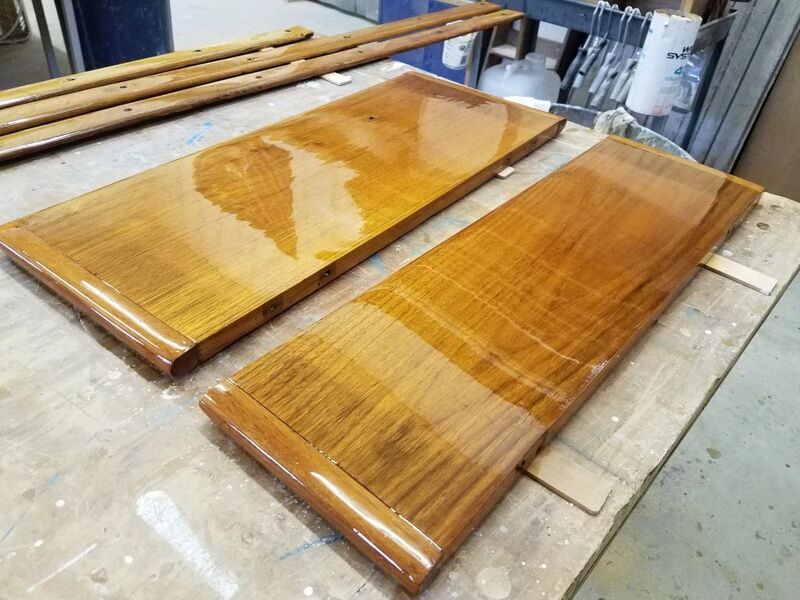 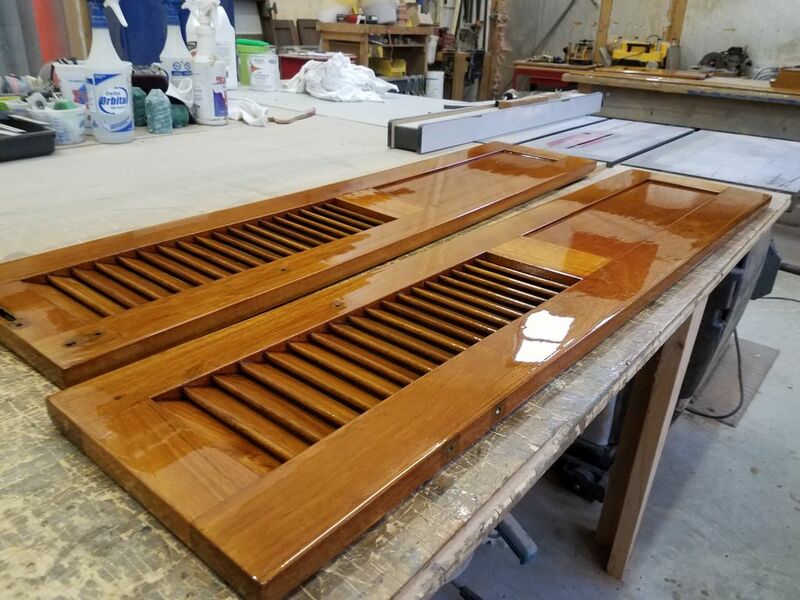 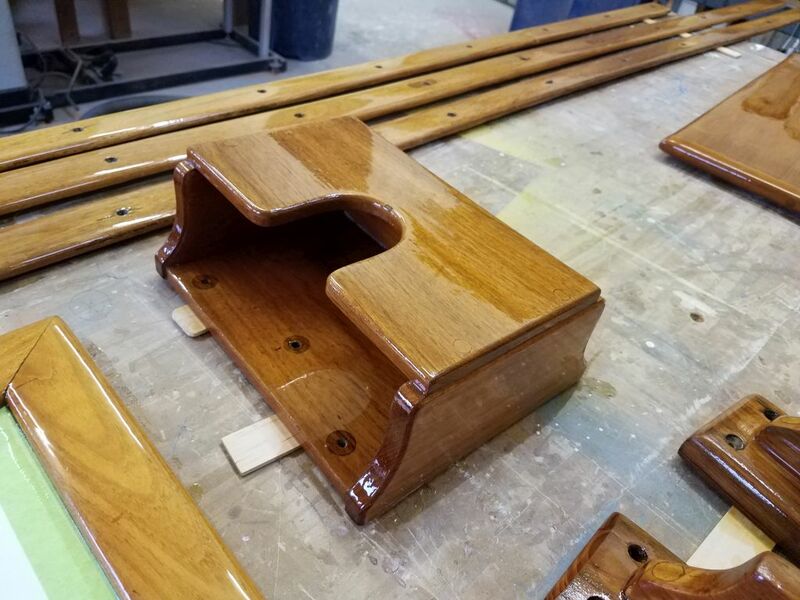 The gelcoat came with a wax additive designed to be used in instances like this where the gelcoat would be open to the air, to allow the gelcoat to properly cure in the open air (the gelcoat straight from the can would only cure to a tacky consistency). 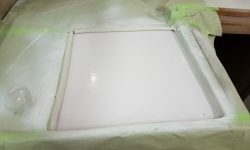 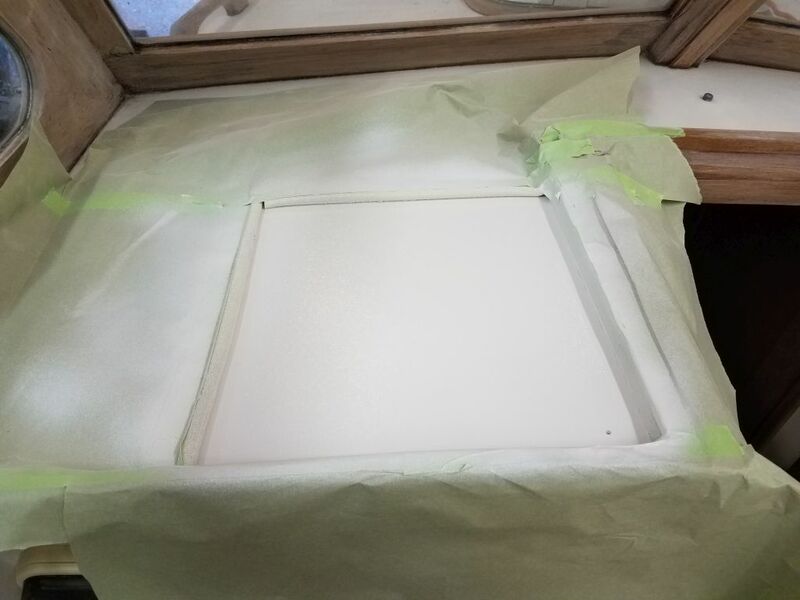 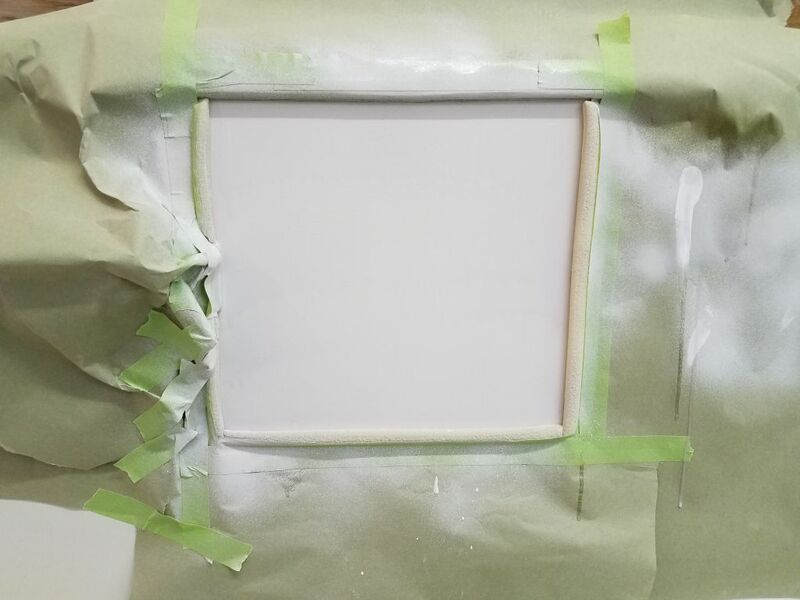 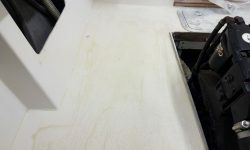 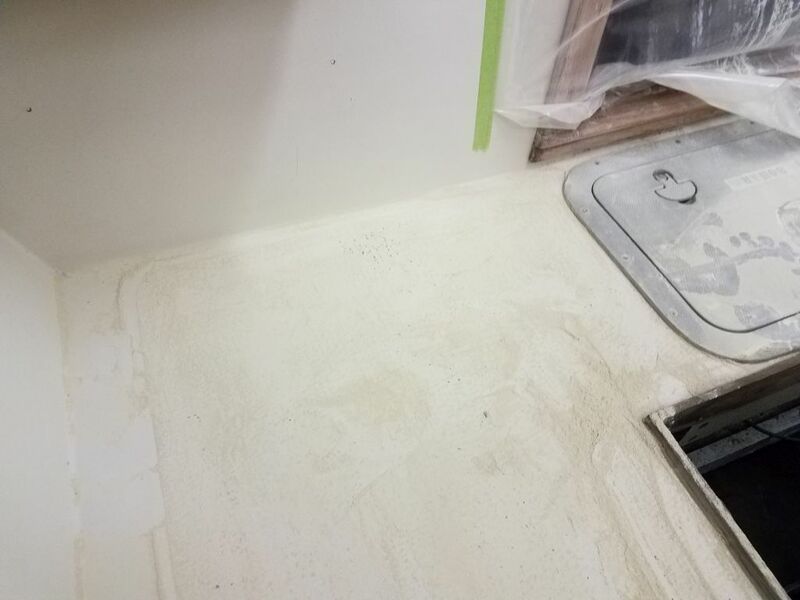 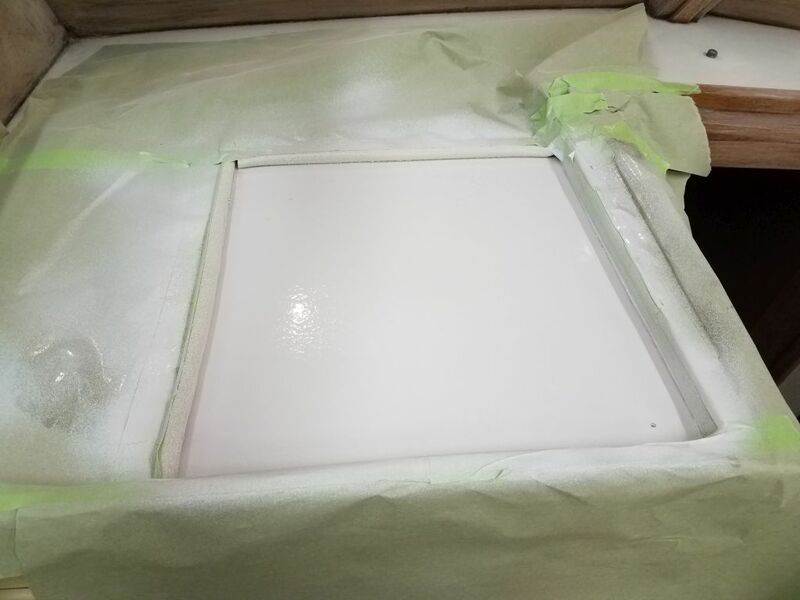 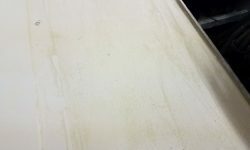 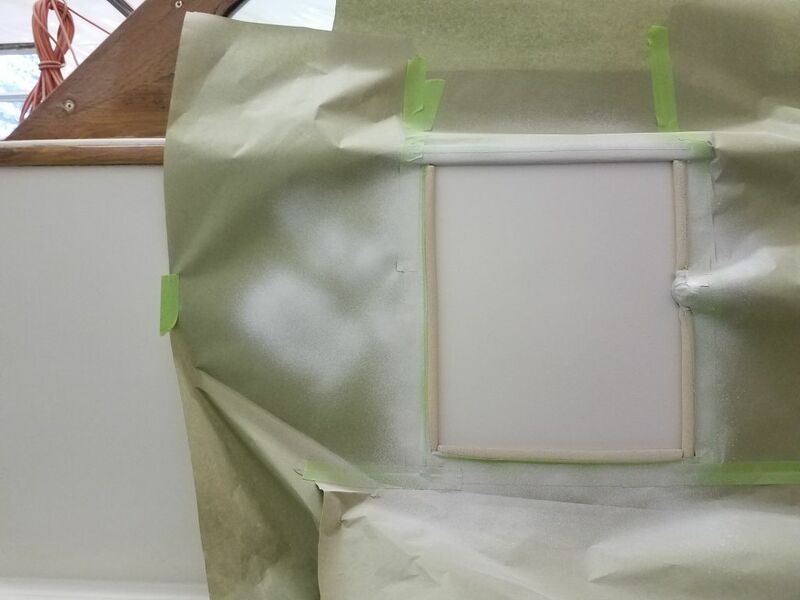 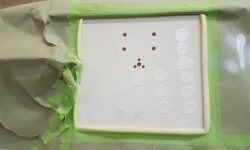 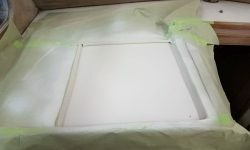 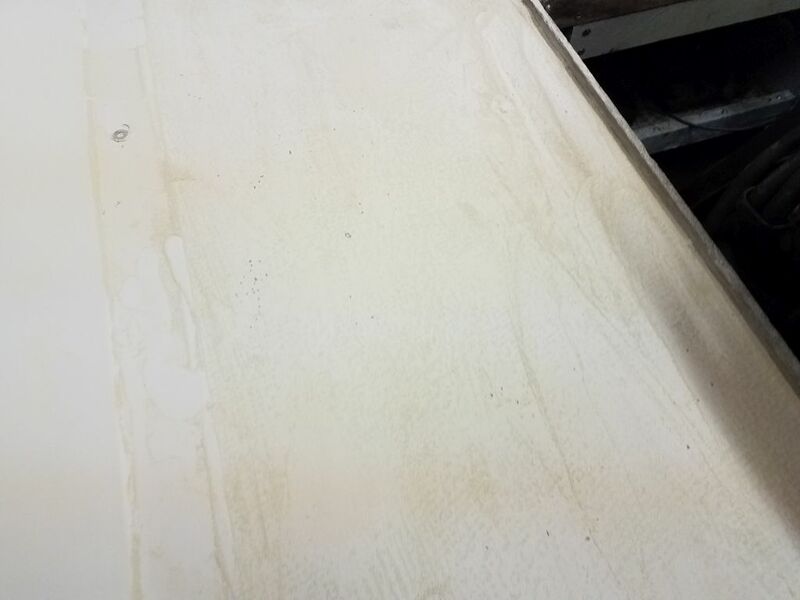 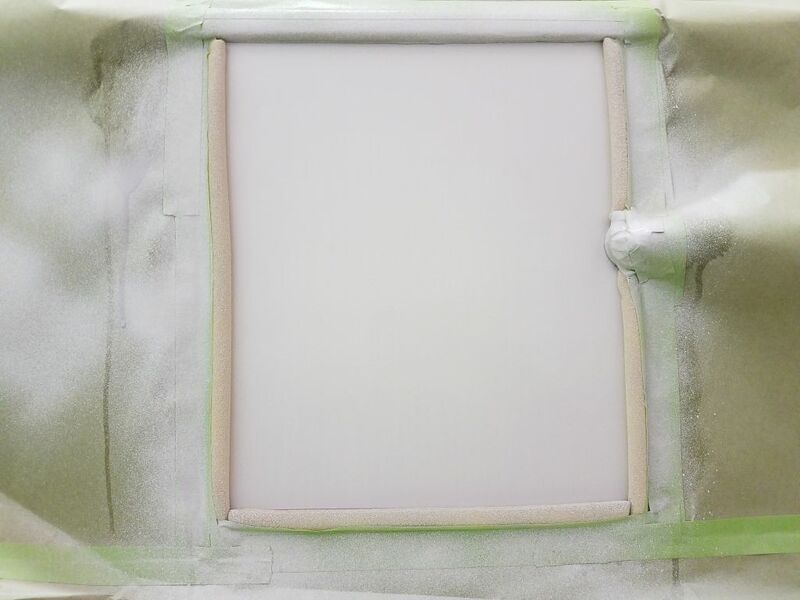 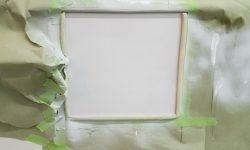 However, I was unfamiliar with the additive, and instead chose my default method of spraying the patches with PVA, which forms a water-soluble coating on the surface and acts as an air inhibitor to allow full curing. 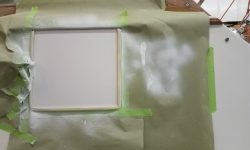 This lent a slight purple color to the patches. 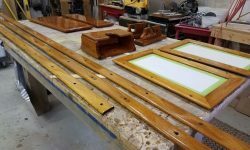 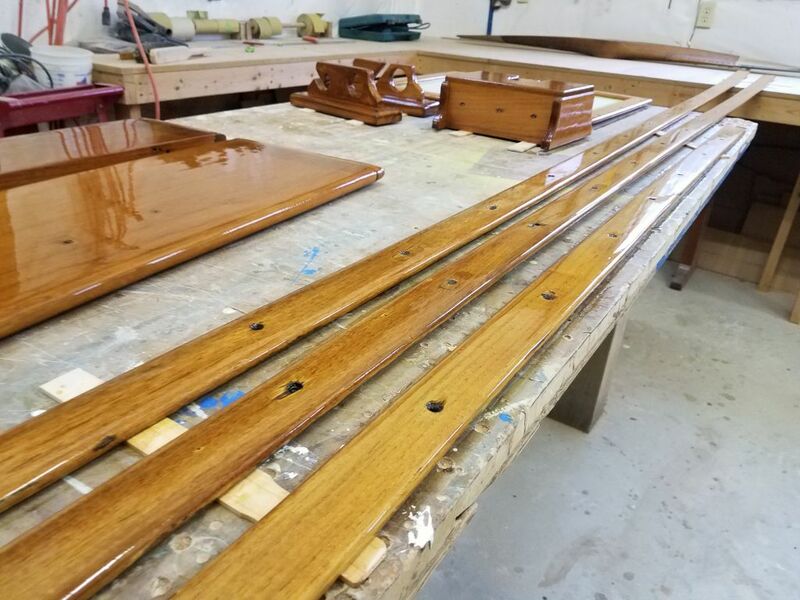 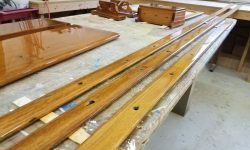 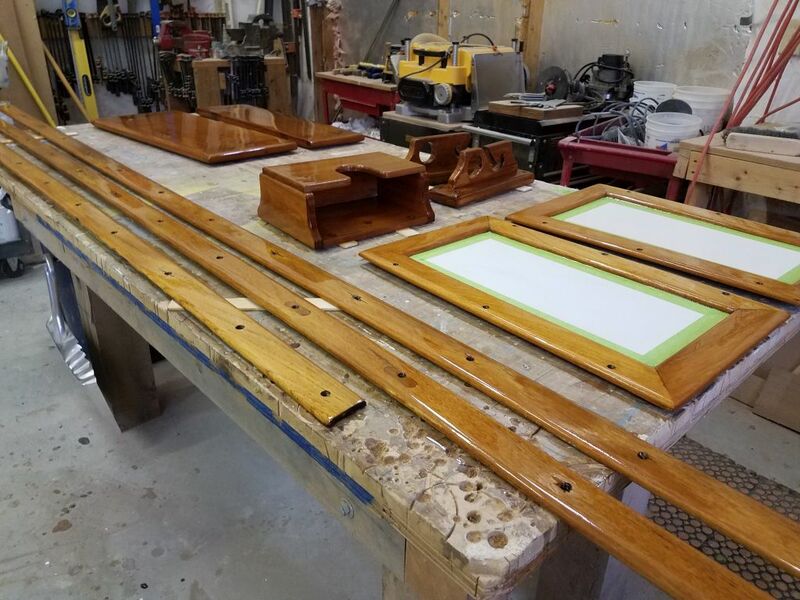 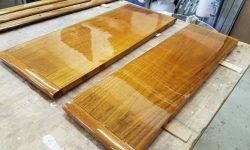 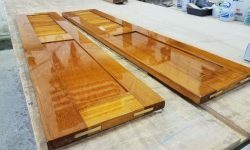 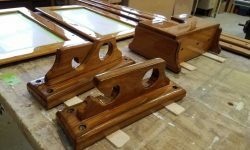 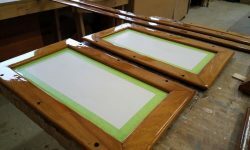 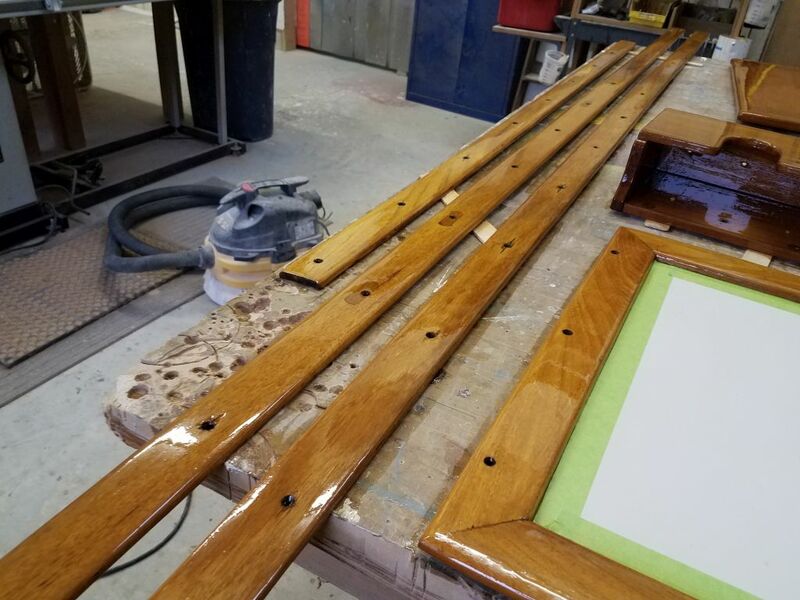 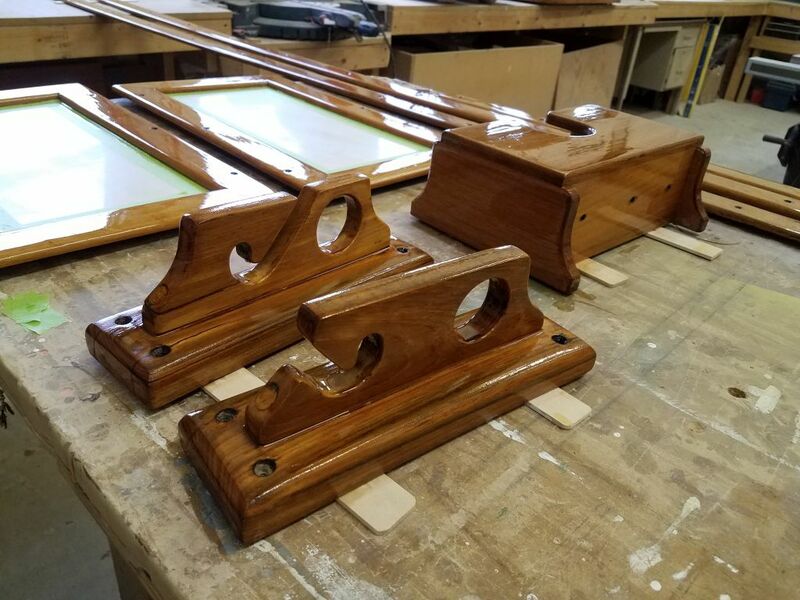 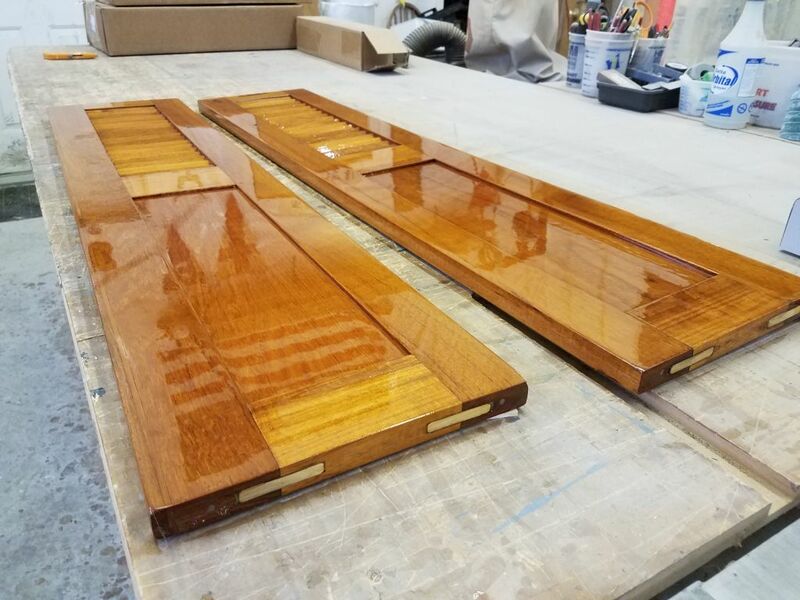 To round out the day, I vacuumed and solvent-washed the various loose wooden trim pieces I’d earlier prepared in the woodshop, and applied the first coat of maintenance varnish to everything but the newly-stripped fishing rod holders, which received a sealer coat of thinned varnish over the raw wood.